« Did HE fall, or was it pushed? 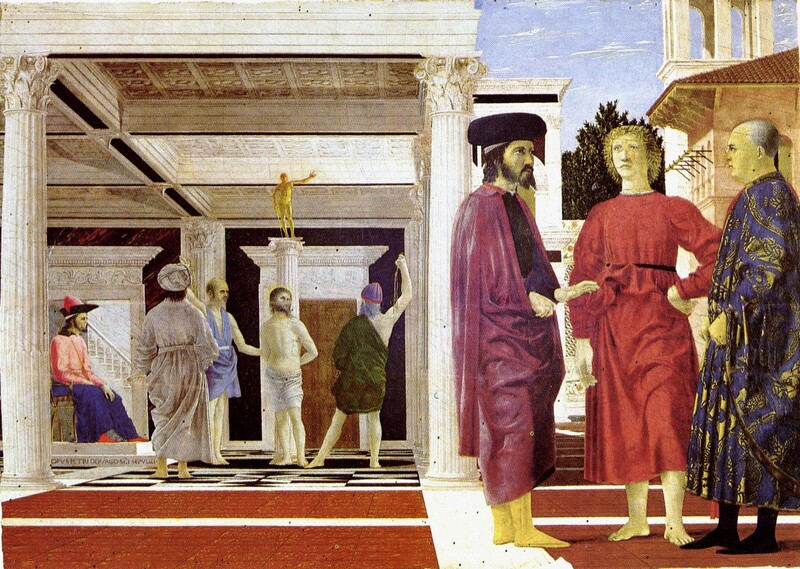 This entry was posted on October 31, 2010 at 10:51 am and is filed under Art, Education, Politics, The Universe and Stuff with tags BBC 2, Mark Collings, Piero della Francesca, Renaissance Revolution. You can follow any responses to this entry through the RSS 2.0 feed. You can leave a response, or trackback from your own site. Many years ago now, when I was 13 or 14, I had a discussion with my father about the subjects I should take at school. This was the time of O’ levels and even at that age, as I’m sure you remember, it was a time to think about your future career and start narrowing down the subjects to study. It was about the time of the Falklands conflict and given my father’s history of fighting in WW2 I was thinking of leaving school at 16 and becoming an artificer in the Royal Navy (while playing football and cricket for England at the same time). 2) Go to university, it’ll teach you how to think. I didn’t join the navy, I never played football or cricket for England, and eventually I did learn how to think. Unfortunately, if I had children, I don’t think I could give them the same advice my father gave to me. According to the Wikipedia article on the latter painting it had an earlier title “They came together” from Psalm 2. If this was the artist’s intent then it sheds light on why figures other than Jesus are in the foreground and who they are. The relevant part of Psalm 2 is about how men of political power stitch up a figure who in retrospect is obviously Jesus. Likely candidates for these men therefore include Herod, who was the puppet king of Judaea under the Romans and hated Jesus; and Caiaphas, the High Priest of the Jews, who sought his execution as a blasphemous heretic. The artist is not above a bit of dramatic license. Jesus was baptised in the river Jordan, not by having a bowl of water tipped over him as shown in the first picture – which is how it was done in the artist’s time. Indeed, patrons usually required they be in the painting too. Some of the characters in the baptism are depicted in Eastern garb, and this dated from a time when there was a lot of discussion of the possible union of East and West to prevent Constantinople falling to the Turks. It didn’t happen, of course. Yes, I know that patrons like to be in paintings, but if the people in the foreground of The Flogging are baddies then the artist has a problem. I’d guess that the bearded one is Caiaphas, with the face of somebody the patron disliked. I know that to go further you would need a huge knowledge of Renaissance painting conventions and personalities, but it seems to me that the quotation from Psalm 2 explains why Jesus is in the background not the foreground, which certainly needs explaining. You can read, in the gospels, who are the politicians who stitched him up and make suggestions who the foreground figures are. Only after that can you play “spot the contemporary” with the faces. I’d like to see if any published analyses of the painting make these points. There are many books about Piero, and especially this work. In fact there was a paper in Nature about it some years ago, although it focussed on the mathematical properties of the composition rather than the political and religious background. I think it’s generally believed that the figure sitting with his back to the viewer on the left is Herod. I saw the picture myself many years ago – it’s in a museum in Urbino. It’s actually surprisingly small (60cm by 80cm). For some reason I had expected it to be a much larger work. Another early renaissance painter I am captivated by is Giotto. The Arena chapel in Padova is completely decorated with frescoes by him, and I think it’s one of the artistic wonders of the world. ps. Something very strange is going on with the light in the Flagellation too. The shadows fall in different directions in different parts of the picture. No figure is sitting with his back to the viewer. Someone is sitting side-on, someone else is standing with his back to the viewer. Which do you mean, please? NB This is not of course Herod who tried to have Jesus murdered as a baby, but a later relative of that name. Ooops. I meant the character standing with his back to the viewer (wearing the long robes; not the one with the whip). I think the seated character to the far left is intended to represent Pontius Pilate. In the interest of accuracy, I should point out that, tonight, I will be watching something else on TV that is likely to prove inspirational. Match of the Day 2 features highlights of Newcastle United’s 5-1 victory over arch-rivals Sunderland. Yes, I thought you would not fail to mention that (more litotes).